After all the talking, after all the hype, after the 21,000 Atleti fans who turned up to watch their side’s final training session, after the Mourinho press conferences, this was it. The first derbi el madrileno of the season. Possibly one of the most important derby’s in some time. And one in which Atleti went, yet again, in search of that elusive victory against their more illustrious rivals. Everyone knows the background to Atleti’s last derby win. It really was 1999 the last time Atleti were victorious and it really was Jimmy Floyd Hasselbaink scoring in that game. Atleti went into this game on form and with an eight point lead over Madrid in the table. And yet, the more things change, the more they stay the same. Madrid took all three points in an awful game illuminated only by a few fleeting moments of magic from Ronaldo. Mourinho named arguably his strongest starting line up for the game, retaining faith in the side that had lost 1-0 away to Real Betis the previous week. Diego “El Cholo” Simeone’s plans were disrupted before kick off when Filipe Luis suffered an injury during the warm up. Although he declared himself fit, Simeone was unwilling to run the risk of a greater lay off as a consequence of his participation. Cata Diaz came in at left back. The only other change for Simeone was the return of Mario following a suspension. Tiago dropped to the bench. Atleti started with the same 4-4-2 formation which had comfortably seen off Sevilla 4-0 in their last league outing. This was a game which was instantly forgettable in so many respects. A game that never developed with neither side showing any real guile or craft until the latter stages when Madrid led 2-0. With both sides noted for their counter attacking abilities and preference to allow their opponent to open up and attack them, the opening goal was always going to be crucial. Yet there were a few bright interludes amidst a scrappy, niggly game. Atleti started brightly if not cohesively when in possession. Both Gabi and Mario were prepared to support their attackers and press Madrid in defence to try and create more of a long ball style game, something which would suit Atleti with a number of their players superior aerially. Too often they went direct seeking their strike pairing. On the few occasions that Madrid had to defend free kicks towards their penalty area, they held a very high line to prevent Atleti players being able to head at goal. If they lost the initial header, Madrid would still be able to compete or the second ball. Madrid were unable to get their forward players involved in the game. Ozil feeding Benzema after 28 minutes was one of the few occasions when they found space behind the Atleti pairing of Gabi and Mario. The one moment which lit up a drab first half was the opening goal by Ronaldo. Arda Turan inexplicably handballed around 25 yards from goal in a central position enabling Ronaldo to strike a perfect free kick up and over the wall for the opening goal. The expression on Casillas face when the goal was scored said everything about it. And the second half continued in a similar vein. Petulant fouls were the order of the day with both sides cancelling each other out. Atleti struggled to get support forward to Falcao and Costa whilst Madrid were unable to break Atleti down with space between Atleti’s compact lines at a premium. The key point in the second half again involved Ronaldo. Miranda missed a header near the halfway line enabling Ronaldo to gather possession. The Portuguese initial pass to Benzema was blocked but he cleverly reversed the ball to Ozil who was free to score Madrid’s second goal. Although he had a relatively quiet night in terms of the quality of his overall performance, Ronaldo’s contribution was still pivotal. The goal changed the dynamic of the game with Atleti having to open up more and chase the game. The player who benefited the most from this was the goalscorer himself, Ozil. With Atleti very compact, space between the lines was scarce in the first half of this game and consequently, Ozil toiled to gain a foothold in the game. Ozil was forced to operate too deep in the first half, unable to break through Atleti’s lines and closely marked but in the second half with Atleti beginning to push forward more and with their players tiring, there was greater space available to move into. Ozil was now playing higher and making passes in the final third of the pitch. His perfectly weighted pass following a quick Madrid transition late in the game saw Ronaldo hit the post. It was one of the few counter attacks with real venom from either side. One of the key areas of the Atleti team is the left wing with the forward runs of Luis Filipe from left back. In league games, approximately 42% of all Atleti attacks originate on the left side. 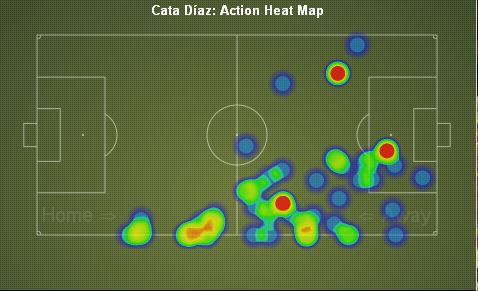 The use of centre back Cata Diaz as a makeshift left back created an imbalance in the Atleti team. Cata Diaz seldom pushed into the Madrid half to support Arda and naturally, gravitated towards the centre of the defence leaving Atleti narrow on the left. Should Simeone have used Cisma at left back? He would have been a more natural fit for the side. The inclusion of Cata Diaz created a real problem for Arda Turan. He was forced to undertake greater defensive responsibilities and offered little in a attacking role. In his 77 minutes on the pitch, Arda completed just 9 passes from an attempted 13. A brief switch to the right flank was marginally successful but left Koke with the same problem on the left. It was somewhat fortunate that Atleti were facing Arbeloa, a conservative full back, and Di Maria, an inverted winger and the defensive duties of Arda and Cata Diaz were never stretched but it came at the price of attacking verve. And with Atleti playing a front two, there was nobody in midfield able to shuffle across and lend Arda some assistance. With Arda pushed back, who would supply the front pairing? The inclusion of Diego Costa was something of a surprise move by Simone. His inclusion meant that Atleti moved to a more orthodox 4-4-2 as had been deployed against Sevilla the previous weekend. This is a departure from the tried and tested 4-2-3-1. 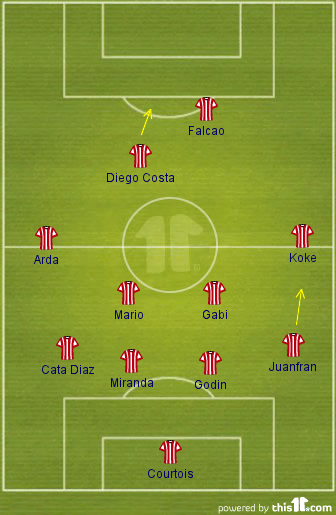 If Atleti were going to maximise the ability and potential of both Costa and Falcao, they needed to get the ball forward but too often Atleti resorted to long hopeful balls rather than moving the ball wide and delivering crosses into the box via Koke and Arda. Just as Atleti had failed to support Falcao in the 4-1 home defeat last season, they again failed to support Falcao and Costa with no service from the flanks. For a side that relies heavily upon crosses, averaging 25 per game, Atleti only attempted 11 crosses. With limited possession and poor passing (only 190 successful passes from 302 attempted) Falcao and Costa were left to forage upon meager scraps. Last season, whilst on loan at Rayo Vallecano, Diego Costa had produced an excellent performance against Real Madrid causing their central defensive partnership numerous problems that evening despite Rayo losing 1-0. It appears that El Cholo believed that Costa could replicate that performance again but it failed to arrive. Costa should have been removed at half time with Adrian or Emre introduced to gain a better balance in midfield with support for Arda. Instead, Diego Costa remained on the pitch with a performance that is best summarised by an ongoing display of petulance towards his opponent, participating in a number of petty feuds across the pitch with whoever would indulge him. Sadly, given the importance of the occasion, too many players on both sides were prepared to become pre-occupied with committing fouls. A total of 42 fouls were awarded during the game with the most surprising feature being the leniency shown by referee Undiano Mallenco. The game rarely developed beyond a few passes before any flow was disrupted. Madrid secure a 2-0 victory but were the real winners Barcelona? They maintain their 11 point advantage over Madrid but now enjoy a more comfortable 6 point lead over Atleti in 2nd place. In a game that was instantly forgettable except for the Ronaldo free kick, the victory was the only thing that mattered and Madrid secured this. Will any Madridista’s complain about the quality of the victory if this is the catalyst to push on in the pursuit of Barcelona? No, the pragmatic will realise this is another 3 points in the bank and an incredibly important 3 points at that. And so the wait continues for Atleti. Another year passes without a win against their great rivals. And Simeone awaits his first taste of victory against Madrid. Having never beaten them during his time playing, he now has two defeats in his short time as Atleti manager. El Cholo must ensure there is no hangover from this defeat. They still enjoy a 5 point lead over Madrid and have enjoyed a superb 12 month period under the stewardship of the Argentinean. They must remain focused and continue to perform as they have done so far if they have any intention of disrupting the hegemony of the big two in Spain.